Sometimes the nerve tissues inside of a tooth can become infected or suffer from an injury, causing the tooth to die. By accessing the canal, removing the dying tissues and sealing off the open chamber left behind, we can help you to preserve your tooth rather than have it extracted. 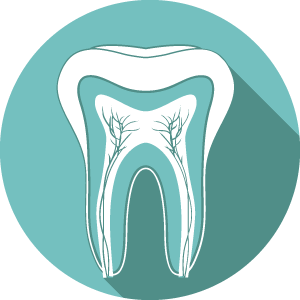 This process is called endodontic therapy, but it’s more commonly referred to as a root canal. Even if your tooth doesn’t hurt, evidence of an abscess or infection on your X-ray will indicate the need for a root canal before more serious complications arise. The earlier we treat the condition, the more likely you are to avoid a toothache. Endodontic therapy is an important treatment used to save structurally sound teeth and avoid unwanted extraction. Although having your tooth removed may seem like the fastest way to relieve pain, it can lead to a host of ongoing dental problems. For instance, removing a tooth creates extra space in the mouth, causing neighbouring and opposing teeth to start drifting out of alignment. To prevent this, you would need to have an implant, bridge or partial created. Or, you could keep your natural tooth! Today’s gentle root canal treatment options make it possible to preserve your original smile for longer than ever before. Plus, our comfort options make treatment more relaxing. If you feel anxious about dental treatment, you can rest assured knowing that getting a root canal feels similar to having any other type of routine procedure. At 7 Pearls Dental, we understand that most patients are anxious about having a root canal. Fortunately, the process is usually just as comfortable as if you were having another type of dental procedure. To ensure that you’re at ease, we use a local anaesthetic to numb the area around your tooth as well as offer the option for oral sedation. In some cases, an antibiotic may be necessary leading up to your scheduled procedure. This medication will help to alleviate swelling and infection, making it easier to numb your tooth and keep it comfortable. A tooth that has had a root canal is no longer alive, which can cause the remaining enamel to be more susceptible to chipping during everyday wear. To protect it, we recommend having a crown made to fit over your tooth so that it doesn’t fracture during day-to-day use. Don’t ignore your toothache; it can’t go away on its own. Contact us today for fast pain relief. We’re open seven days a week!